Take nothing away from now dual Everest champion Redzel, but the run of third placegetter Osborne Bulls was simply out of this world. Unless this was a career high that can’t be replicated in future, the five-year-old has announced himself as a serious sprinter in what was easily his toughest test. Punters Intel data shows Redzel basically won the race in the first 400m running 24.18 before getting a breather and from there Kerrin McEvoy was able to rate the gelding as he liked. While his last 600m of 36.45 was only the third fastest in the Everest he was able to kick away between the 400m and 200m (11.82), which was the section Osborne Bulls spent getting out near the outside fence. That poses the question – where would Osborne Bulls have finished had he not gone sideways for a furlong? At around the 800m he conceded Redzel over 17m. He clocked the fastest last 600m of the race in 36.05 and easily the best individual splits for the last three 200ms. He ran 0.10 quicker than Redzel from the 600m-400m, 0.15 faster from 400m-200m and 0.15 quicker for the last 200m. And let’s not forget the performance of the three-year-old Graff who was stuck wide but showed so much class in running fifth. He ran 36.52 for the last 600m and it seems the effort only told on him late as he matched Redzel’s splits down to the 200m before knocking up running 12.81 for his last 200m. Of course the performance of the day went to Pierata, who made a mess of his Sydney Stakes rivals in running the fastest last 600m of the day in 34.81. We’ll never know what might have been had he made The Everest field. Josh Parr was responsible for a classic front-running ride on Stampede in the Star Mile (1600m) at his first run back and with 61.5kg. 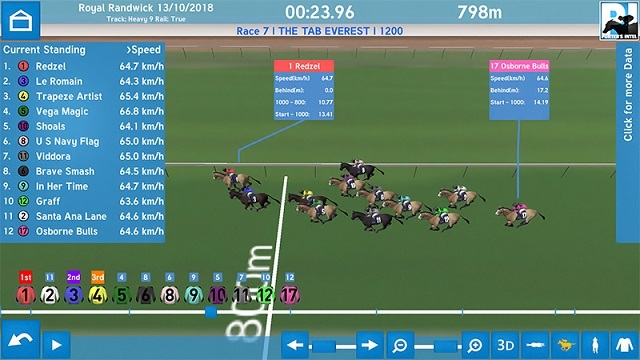 A little like Kerrin McEvoy later in the Everest, Parr established a lead quickly then was able to back off and run the race to suit himself. Parr gradually increased the tempo each 200m split from the 1000m down to the 200m and his final 200m of 11.97 was only 0.31 slower than his previous 200m section. It was also 0.3 seconds faster than any other horse’s last furlong so no wonder he broke right away. There’s a decent win in the Kris Lees filly Evalina following her super effort in the Reginald Allen (1400m). She missed the start and, given the winner led, to just miss speaks volumes about her talent. She ran 35.58 for the last 600m, 0.4 seconds faster than any other, and 12.29 for the last 200m which was 0.26 better than the next quickest. A mention to the two-year-olds, the winner Anaheed looks to have a big future. She ran 35.71 for her last 600m and 12.44 for the last 200m and put a healthy margin on the rest of the field. That said, runner-up Disruptor should have finished a bit closer. The crucial section for her was the 400m-200m where she only ran 12.10 compared to the winner’s 11.74 after being held up for a run. She picked herself up to run 12.63 for the final 200m in a promising debut.